The recipe for the day comes from a basic cookie recipe packed with great ingredients. My Baking Addiction made a coconut pecan chocolate chip cookie that made my mouth water so I started thinking about cookies and what else I could cram into a cookie. I like the idea of coconut right now. It seems quite fitting for summer and tropical goodness. My mind began churning and I remembered a strange and very impulse purchase I made a few weeks back at the register of trader joes. 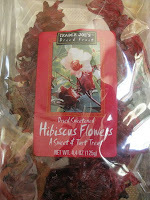 They were dried Hibiscus flowers (as seen below). 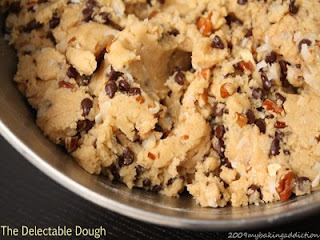 Why not nix the chocolate chips and pecans and really make a tropical treat by chopping up a few of these (or the bag) and putting them in the cookies. The fruity taste would completely complement the coconut so why not. Here is my recipe with a twist. 1. Place oven racks in the upper and lower 1/3's of the oven. 2. Heat oven to 350°F. 3. Grease two large cookie sheets. 4. Mix flour, baking powder & salt in a bowl or bag and set aside. 5. Mix butter and sugars with with a mixer until blended and smooth, add eggs & vanilla; mix until incorporated. 6. Add dry ingredients and mix until just combined. 7. Stir in hibiscus and coconut. 8. Divide into 18 equal balls, a 2" cookie scoop works just about perfectly. 9. EVENLY space 9 on each cookie sheet. 10. Bake for 12-18 minutes, rotating front to back and top to bottom after 8 minutes. 11. Cool on sheets to maintain chewy texture. I would like to take My Baking Addiction for her great recipe and beautiful picture.